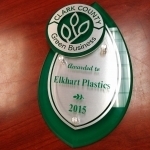 RIDGEFIELD, WA – Elkhart Plastics, Inc. (Elkhart Plastics) is pleased to announce that its Ridgefield, Wash., facility was recently certified by the Clark County Green Business Program. 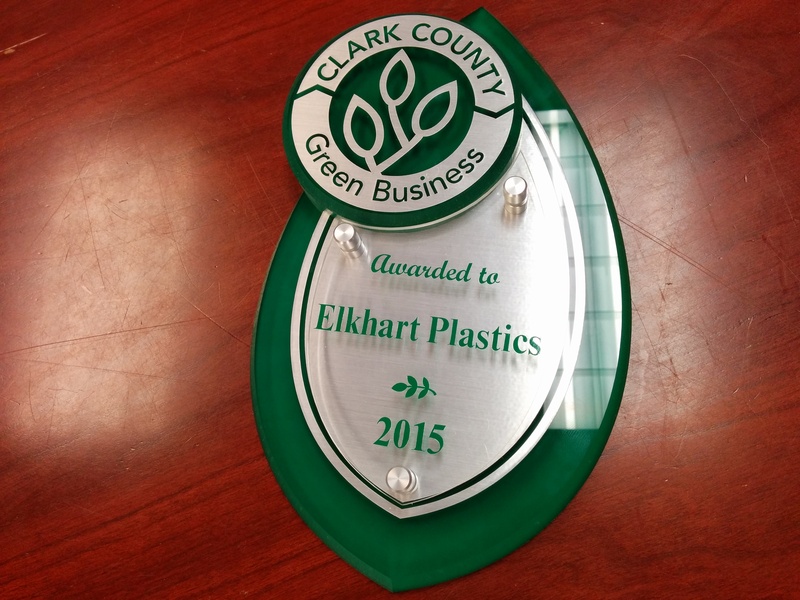 Elkhart Plastics representatives attended an awards ceremony on March 19 to accept the plaque designating the certification. The program recognizes and celebrates the achievements of environmentally responsible businesses in Clark County, Wash. Participation in the program reinforces Elkhart Plastics Ridgefield’s dedication to the environment and includes efforts to monitor and reduce storm water pollutants and water, wastewater, and energy consumption; safely handle and dispose of toxic materials; and monitor waste management procedures to reduce waste and increase recycling efforts. “I’m proud of the team here and the effort that they put in to get us to this point,” said Noah Wass, engineering manager at the Ridgefield facility. For more information about the Clark County Green Business Program, visit www.clarkgreenbiz.com. Elkhart Plastics, Inc. is a 27-year old company providing rotational molding capabilities for customers. Six plants across the United States offer unique solutions for each customer. Understanding that the application drives the design, these committed problem-solvers work as an extension of their customers’ organizations to deliver creative solutions for their customers’ unique applications and parts.